Whenever I used to see a recipe for cinnamon rolls, I would look at it with longing and envy. Longing because, well, who does love a piping hot pan of fresh cinnamon rolls staring at them from behind the computer screen (or better yet, on a table in front of them). And envy because, the recipe I was looking at meant that someone, somewhere successfully made something that I didn’t think I could. Well, hallelujah, rejoice, and dig in because dangonnit, I’ve done it! I’ve made my first-ever ooey, gooey, fluffy, soft, ridiculously delicious cinnamon rolls. And they’re pumpkin spiced and taste like fall and will make you want to snuggle up by a fire with a newspaper and coffee. Mmm, don’t you love this season? There’s no stand mixer or fancy equipment required for this recipe, just your hands, some time and a little patience. For a first effort, I considered this recipe very simple for the good lookin’ and scrumptious cinnamon rolls that resulted, and I know that you’ll agree, too. The subtle pumpkin flavor combined with the spiced mixture of cinnamon, nutmeg and brown sugar is heaven on earth, and topped with a quick and easy maple cream cheese glaze, these rolls make for one lovely way to liven up your morning! In small saucepan, heat milk and 2 tablespoons butter just until warm (120-130 degrees) and butter is almost melted, stirring constantly. In large mixing bowl, combine pumpkin, sugar and salt. Add milk mixture and beat with electric mixer until well mixed. Beat in egg and yeast. In a separate mixing bowl, combine flours. Add half of flour mixture to pumpkin mixture. Beat mixture on low speed 5 minutes, scraping sides of bowl frequently. Add remaining flour and mix thoroughly (dough will be very sticky). Turn into lightly greased bowl, then grease surface of dough lightly. Cover and let rise in warm place until doubled, about 1 hour. Punch dough down. Turn onto floured surface. Knead a few turns to form a smooth dough, sprinkling with enough additional flour to make dough easy to handle. On lightly floured surface, roll dough into 12x10 inch rectangle. In small bowl, combine brown sugar and cinnamon. Brush surface of dough with melted butter. Sprinkle with brown sugar mixture. Beginning with long side of dough, roll up jellyroll style. Pinch seam to seal. With sharp knife, cut roll into 12 1- inch slices. Place rolls, cut side up, in greased 9 inch round or square baking pan (If using round, there will be a few extra rolls which you can simply place into another small pan). Cover and let rise until nearly doubled, 30 to 45 minutes. Bake rolls at 350 degrees about 20 minutes or until golden. Using tongs, gently remove rolls from pan to wire rack. Cool 10 to 15 minutes. Drizzle with Maple Cream Cheese Glaze (recipe below) and serve warm. Combine cream cheese, powdered sugar, butter, vanilla and maple syrup in medium bowl. Whisk until smooth. Spread glaze on rolls. Serve warm or at room temperature. I honestly think I can do this, thank you for the simple recipe and the shot of confidence. These sound delicious and look amazing. Great post! These look amazing. I wish I had some right now! Could these be any more delicious looking? I think not. Stunning photographs. These look just perfect, my friend. I am making cinnamon rolls for a baby shower on Wednesday and these might just have to be the recipe I start with! How are you? I was thinking it might be fun to do a bake-together in the next few weeks. Maybe we could do a few pies? Let me know! I’m such a stinking chicken about making recipes with yeast. The whole rise and knead and rest gives me fits of panic. These do look mighty yummy though. Right now I am really wishing I didn’t use up the last of that can of pumpkin! These look lovely Georgia! I’ve yet to make cinnamon rolls from scratch. These sound perfect. These sound heavenly! They look amazing too! They are going on my must make list! Big fan right here! I’ve been meaning to try a pumpkin flavoured cinnamon roll for a while. Love this recipe! Can I have a huge pan of these? Right now? I’ve been meaning to make pumpkin cinnamon rolls…. so enticing!! There are so many awesome things about this recipe. First and foremost, FALL-flavored cinnamon rolls. Just when I thought this breakfast treat couldn’t get any better. Also, congrats on tackling your first cinnamon roll recipe and making it a success! They look GREAT! Oh my goodness, how did I miss this recipe?? 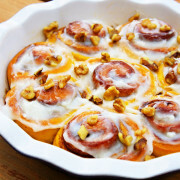 I so love cinnamon rolls and am always looking for new spins on them… these sounds perfect!